Jonny Howson is well aware of Middlesbrough's impressive defensive record and feels confident whenever his side take the lead. 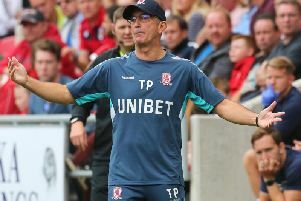 Boro have conceded just four goals in the Championship this campaign, the lowest in the division after 11 games, while Tony Pulis' side have dropped just two points from winning positions this term. The Teessiders moved back up to second in the table after a convincing 2-0 win at Ipswich last night, following first-half goals from Mo Besic and Stewart Downing. And Boro's defensive solidity is breeding confidence throughout the team. "I think our defensive record - if we can get in front, certainly with a couple of goals - as we've seen so far this season we're a very solid side and very hard to beat," said Howson after the game. "On the whole, two good goals, another clean sheet and another three points." After deploying a 3-5-2 formation earlier in the campaign, Pulis switched to a back four against Ipswich, with Daniel Ayala and Aden Flint in the heart of defence. On the whole, Boro looked assured at the back for most of the night, but did concede some chances in the second half. Howson knows there is still room for improvement, and Boro will need to maintain their high standards against the better sides in the division. "We got off to a great start with two quick back-to-back goals," added the 30-year-old midfielder, who has been one of Boro's star performers this season. "After that you're looking and thinking possibly we could have kicked on, but we got a bit sloppy and gave them some encouragement to get back into the game. "It could have been a little bit better from that point of view."